Don’t want to live in a robotised world? Then stop calling it in. 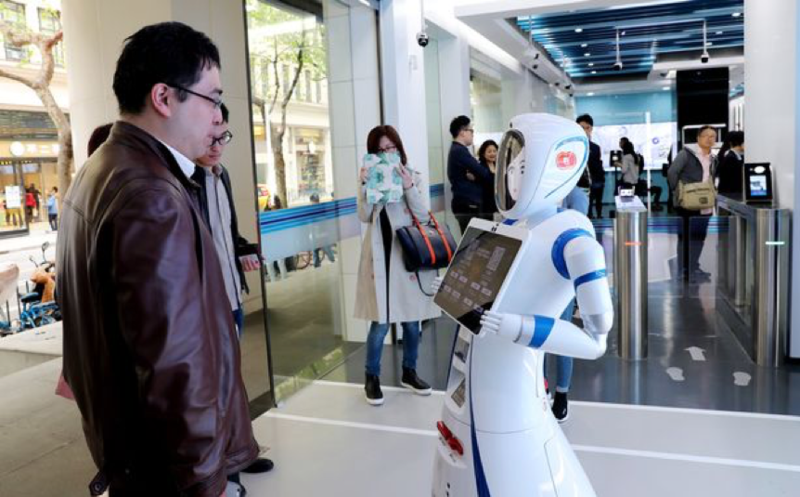 So China has unveiled a bank, the first in the world, to be fully staffed by robots. And that’s not a glamorous name for a computer algorithm. We’re talking actual robots. Look at the photo. The receptionist looks like Astro-boy. Robots greet customers and manage accounts. “The Shanghai branch of the China Construction Bank (CCB) is run purely by technology – with virtual reality, artificial intelligence and facial recognition all playing a part. CCB, which is China’s second-biggest bank, already has 360 branches across the city, with smart machines appealing to its tech-savvy customers and slashing of staff costs making it a winner for bank bosses. The store is equipped with several smart automated tellers capable of a range of services, including account opening, money transfer, foreign exchange, gold investment and the issue of wealth management products. The bank says the new set up will be able to handle 90 percent of the cash and non-cash demands of traditional banking outlets. Wow. So far it’s a one-bank trial, but you can be sure more robo-banks just like it are coming. Now I get that bank-telling wasn’t rocket science, but I also thought it was still a reasonably complex role. I hadn’t realised that the frontiers of automation had advanced this far already. I thought we were still in the phase of banging in nails and tightening screws. But no, we’re now in the phase of voice-recognition and opening a bank account for you. There’s two drivers of this. The first is profitability. Robots, even Astro-boy looking ones, are cheaper than real staff. If you can have them handling 90% of your customer interactions, that’s a massive cost saving. That’s supply side. The second is convenience. That’s demand side. Initially, talking to an AI bot was very frustrating. You longed to be able to talk to a real person. But these days, we all kind of know how AI works. We all know how to frame our requests in a way that the Google algorithm will know what we’re searching for. Talking to AI robots is like that. And so we’re getting better at it. The gap between AI and humans, as far as customers are concerned, is narrowing. At the same time, we hugely value the convenience robots can offer us. 24/7 access, the ability to let us waffle around stupid requests, access to encyclopaedic knowledge and an ability to teach itself. And of course, cheaper is nice. And so the robo-revolution won’t be foisted on us by heartless corporations. We will call it on ourselves. And every time we spend a dollar at the robo-café, because the coffee is cheaper and always comes at a consistent temperature, we’ll be casting a silent vote in favour of making humans obsolete. Many of us miss the corner store. But how many of us would actually shop there if they still existed? We romanticise milk-men, but how many of us were actually buying from them in the final days. And we all like the idea of humans doing customer service, but are we willing to put our money where our mouths are. And the march of robots will advance without resistance.